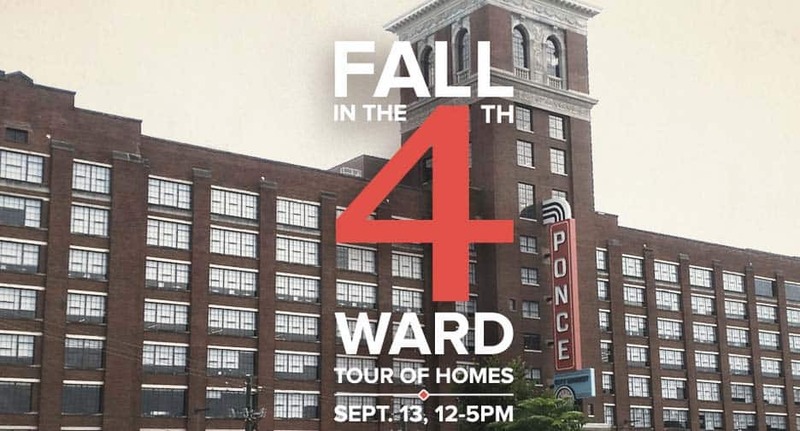 Nandina is pleased to announce our participation in this year’s Old Fourth Ward Tour of Homes – a part of the neighborhood’s “Fall in the 4th” festival. The Old Fourth Ward is a historical neighborhood located just south of Downtown Atlanta. The neighborhood is currently experiencing a wave of revitalization, due in part to projects such as the Beltline and Ponce City Market. The Beltline is a former railroad corridor under development in stages as a multi-use trail for running, walking and biking, and Ponce City Market is the former Sears-roebuck distribution center which is being converted into a mixed-use development. Projects like this have brought new life to the area, and with a mix of older bungalows, modern homes and new loft-style apartment complexes, it has become a hot spot for families and young singles alike. In recent years, the “O4W” has become a striking symbol of intelligent gentrification. The neighborhood continues to grow and thrive – while the authentic flavor of this historic area remains preserved. On this tour, guests will be invited to walk through a number of different homes – with a wide range of size, type, and style. From traditional to modern, single family to apartment units, the beauty and variety of homes in this area make this home a must-see. The home designed by Nandina is located on John Wesley Dobbs (see a map of the tour of homes here) And is the work of designer John Ishmael. The home was built in the classical Arts and Crafts style. The exterior features low-pitched roof lines with deeply overhung eaves and exposed decorative brackets. The homeowner loves the roomy front porch with its tapered, square columns. An avid gardener, the has sprinkled color all over is front yard, with beautiful flowers spilling out of every corner, giving a friendly welcome to visitors, beckoning you to come inside. The style of the interiors is transitional. It is a two story home with a full basement and open floorplan. Typical of Craftsman design, there is a lot of attention to details in this home, from the crown moldings to the wainscotting, and we tried to highlight these features in our design. Want to see inside this beautiful house and many more? We know you do! The event runs from 12-5 this Sunday, September 13. Click here to purchase tickets for the event. Come out and say hello to designer John Ishmael and the whole Nandina team! We can’t wait for you to see the amazing interior of this home. We know you’ll be inspired to tackled some new design projects in your own house!